GAINESVILLE, Florida -- Biologists have found a major clue in a 50-year-old mystery about what happens to green sea turtles after they crawl out of their sandy nests and vanish into the surf, only to reappear several years later relatively close to shore. In a paper set to appear Wednesday in the online edition of the journal Biology Letters, three University of Florida sea turtle scientists say they found the clue by analyzing chemical elements ingrained in the turtles’ shells. Their conclusion: The turtles spend their first three to five “lost years” in the open ocean, feeding on jellyfish and other creatures as carnivores. Only after this period do they move closer to shore and switch to a vegetarian diet of sea grass – the period in their lives when they have long been observed and studied. The paper’s lead author is Kimberly Reich, a UF doctoral student in zoology who did the work as part of her dissertation research. The other authors are Bjorndal and Alan Bolten, a faculty member in zoology and associate director of the sea turtle center. Famed sea turtle biologist Archie Carr first discussed the mystery of the green sea turtles’ “lost years” in his 1952 book, “The Handbook of Turtles.” Half-dollar sized hatchlings trundle off subtropical and tropical beaches worldwide, then vanish, only to reappear, dinner-plate-sized, over continental shelves in depths of less than 650 feet. Only a tiny number of green turtles between the half-dollar and plate-sizes have ever been spotted. To solve the problem, Reich, Bjorndal and Bolten turned not to scouring the ocean but rather to a technique that over the past two decades has become increasingly important in questions related to ecological origin: stable isotope analysis. The higher an animal on the food chain, the more heavy isotopes it accumulates. As a result, the technique, which measures the ratios of heavy to light isotopes, can distinguish samples from herbivorous versus carnivorous creatures and where on the food chain they lie. 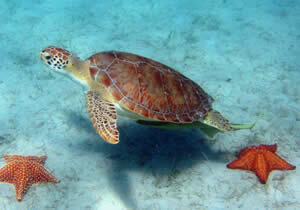 The researchers captured 44 turtles off a long-term study site near Great Inagua in the Bahamas. The sample included 28 that had been tagged in previous years, indicating they were residents of the site, and 16 untagged turtles assumed to have recently arrived. They cut off tiny pieces near the center of the turtles’ shells in a harmless process that Bjorndal likened to trimming one’s fingernails. The biologists used a mass spectrometer, a machine that separates isotopes according to charge and mass, to analyze the oldest, or earliest-grown, portions of the shell sample versus the newest portions. The analysis revealed that with the new arrivals to the site, the ratio of light to heavy nitrogen isotopes in the older versus new shell samples was “significantly different,” as the paper said. The ratios were very similar to ratios observed in oceanic-stage loggerhead turtles known to be carnivorous. For these reasons, among others, the researchers concluded the turtles spend their first three to five years in the open ocean. Green turtles nest on subtropical and tropical beaches worldwide. That suggests the young turtles are widely distributed in the oceans during their oceanic stage, but Bjorndal said further study is required to confirm that. Green turtles are the ocean’s largest hard-shelled turtle, with only soft-shelled leatherbacks eclipsing their size. They were heavily exploited for food by native peoples and then by explorers and colonists who prized the animals for remaining alive and fresh for months on ships. Although they were among the first animals listed under the Endangered Species Act in 1973, they and their eggs continue to be hunted in much of their range today. Interesting, but it seems strange that none have ever been been taken in midwater trawling or observed coming to the surface for air.